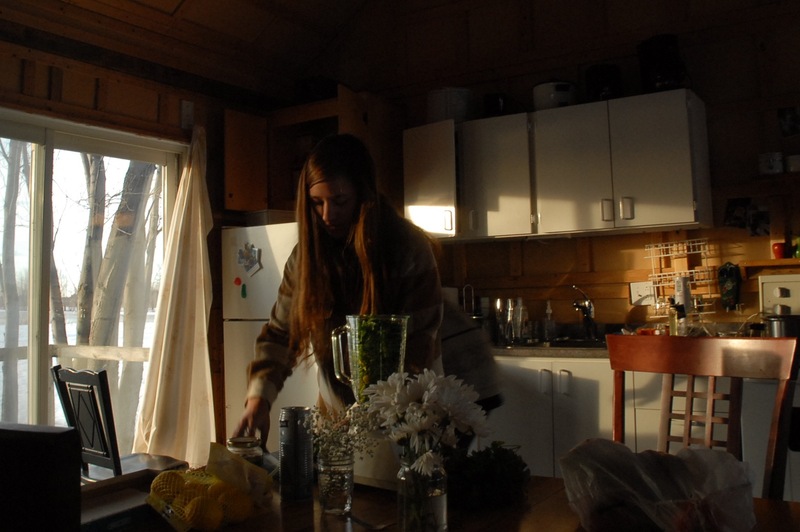 My best friend was turning 25 years old on April 10th this year, and to celebrate, we left to her mother’s cabin situated between Trois-Rivières and Quebec City. The plan was to drive from Montreal early on Thursday morning with my three closest childhood friends, and then two other cars packed with other friends would come in, one at a time, one on Thursday night and the other on Friday night. Gab had told me to meet her and Raph at the grocery store at 10, after me and Gab each got out of our distinctive yoga studios. My class ended at 9h30, I changed and I went down St.Laurent to the grocery store. I arrived there, I came, I saw, I shopped and I waited outside for a good half hour. I ran into an acquaintance who told me that the girls had been out partying the previous night. Gab was supposed to come by car so we could carry the groceries and leave, but she arrived on her bicycle. She hadn’t been home. I was quite frustrated to be stood up in the middle of the street by my best friend, who was in charge of the whole operation. ‘‘I’m so sorry Lili, I know it’s what pisses you off the most, when people keep you waiting’’. As I sipped ginger kombucha and waited a little more, Gab stormed into the grocery store and came out with another box full of food. We hailed a cab, putting the groceries in the trunk. Because Gab was cycling, I was alone in the cab, chatting with the cab driver as usual. We were in a sea of orange cones, with works happening on Rachel St., among others. In the cab, I called Raph again. ‘‘Yes, I’m leaving soon!’’, she made clear, before her phone died. I can never be pissed off at Gab for too long, and as soon as we went back to her place and had breakfast, I wasn’t angry anymore. We sipped coffee and talked, and she told me all about the previous night. She also told me that our friend Elyse was really drunk by the end of the night and was being over-the-top, so they left her at the bar. I was really worried about her, so I called. She replied with the most cavernous voice I’ve ever heard. -Okay. Drink a lot of water, dress up, maybe take a shower. We will be there in about half an hour, I’m calling you back when we are on our way. ”Lili, you’re gonna be such a good mom. In the meantime, we were still waiting for Raph. She arrived in an a sporty outfit and sneakers, her long mane tucked into a ponytail. She rushed in and told us about her night: she had hung out with a good guy buddy of hers and they did drugs, MDMA included. ”It was way too much fun!”, she kept saying, to my disapproving eyes. Me and Gab looked at each other in complicity. ‘‘Raphie!’’, we said as we told her not to banalize the situation, since she is prone to like more toxic, performance-enhancing drugs. This always worries us. Raphie still had work and packing to do before leaving Montreal, which made us a little impatient due to the lack of consideration. Finally, we were ready to leave. I called Elyse again, who agreed to wait for us outside. She still had dark makeup on her face and was crying and holding a pillow. ”Oh boy,”, we all said when we realized that the girl had indeed a terrible hangover. She embarked into the car in the back along with her miniature greyhound dog Sigur (as in Sigur Ros) on her lap. Raphie had to send papers for her taxes and so we went to the pharmacy on Mont-Royal ave.
Me and Gab went out to grab coffee as Elyse stayed in the car. I gave Elyse and Gab their respective coffees, and sat in the passenger seat. But by the time that Raphie went back to the car, Elyse started feeling like throwing up again. We made it onto a side street, where Elyse found a narrow lane to throw up in. It was so bad that it was funny, and we all laughed about the situation. After she did her deed and fell better for it, we left for real. Being four girls on the road, we felt that we were inside an episode of Girls, and we indeed talked about the TV show exhaustively. Raphie and Elyse processed to explain thoroughly who the four characters were to Gab, who never watched the show. Of course, we were all awarded a character that fitted with our personalities. The girls decided that I was Hannah. -I see you as the main character’’, said Raph. ‘‘Yeah, me too, I see you like a main character’’, said Gab. We all erupted in laughter. But it made sense, given her knack for storytelling and writing, and her sometimes kooky personality, Hannah was the character that suited me the best. Basically, we all wanted to be Jessa, the cool girl. The role was awarded to Raph. It was especially fitting because of her long hair, what she had done the previous night, and her tendency to not always know what she wants to do, but having fun while at it. She is also the most mysterious and travels a lot. Sometimes, she hurts her friends and looks down on people, but that is also because she is fiercely independent. Shoshana was awarded to Gab because she’s funny, is a very good friend, can be silly but at the same time has a head on her shoulders. She is simple and down-to-earth. Marnie was Elyse since she is the one most likely to doubt her feelings. She likes to experiment, but is not always happy. She has the most beautiful body of the group, and is a go-getter. We were listening to amazing up-and-coming bands like the Allah-Lahs, Mac Demarco or Blouse in the car, courtesy of Raph’s iPhone. It was the perfect breezy soundtrack for our escape. But then hunger stroke her. ”I want poutine!”, she kept saying. As we were driving through the countryside, we went to a little snack bar held by a tiny blonde lady. It was typical countryside Quebec, a white and blue wooden shack. We asked her to take a picture of us with an iPhone, and she didn’t know how to use it. It was not the best picture, but it was a funny moment in time. We had poutine sitting on plastic benches while Sigur was chilling outside. After poutine, we wanted beer, so we made a quick stop at the gaz station to buy a multipack of beer. We made it to the countryside, and when we pulled onto the tiny road leading to the house, there was already a flood in the making. We passed with the car feeling as though it was a boat. We barely made it on the other side. We went into the house, put the stuff into the fridge and cracked open a beer. Even Elyse had one, and we proceeded to play Scrabble. We went outside and talked to the elderly neighbour, Jacques, who was a lovely man, and he told us that around that period every year, there was floods, especially on top of the farm fields. A little later, Jacques came back, waving through the window. ‘‘Whose birthday is it? She’ll be surprised’’. When Gab came back from her walk, he gave her a small treasure hand-made wooden chest in wood. ‘‘I have a lot of time on my hands in the winter,’’ he said. We left the countryside to go to Gab’s mother place, in a small town near Trois-Rivières. It was luxurious compared to the damp cabin. Two of our friends (a couple) came to meet us and we had plenty of amazing food, wine and even a gluten-free cake. The next morning, I was the first person to wake up in the house. I slept badly with Raph on a inflatable mattress. I went upstairs and had coffee with Gab’s mother, who is like a second mother to me, and whom I haven’t seen in ages. I was taken care of with coffee and breakfast, and it was lovely to hang out with her and her boyfriend in the morning, catching up before we became a group again. Around twelve, we went back to the countryside and this time, the water levels were dangerously high. Jacques told us that when our other friends were to come by, he would pick them up on his pick-up truck, as it could wreck a car completely. We started drinking early and played games of Scrabble and Monopoly. We also went for walks, watching the geese come back and the snow melting, creating rivers. There was a huge snowbank in front of the house. Raphie was walking on top of it when she got stuck, up to her waist in the sticky snow. I tried to help her to get out, but I was stuck as well. Gab came to help, and had her head into the hole. She could barely breath when Raph got her out. I became frozen and panicky. Nature had too much control over us. I went inside for a bit, recovering for the nature but feeling that whatever happened, my girls and I had each other’s back. Later that night, people came from Montreal, eager to party but we were exhausted. We could now barely get out as there was snow and water everywhere. We were stucked in the cabin, like we were on an island in the middle of a lake. It was surreal, to be confined to a small house consisting of one large room. We were eleven colourful, loud and unique individuals sharing the space. We had dinner together (Mexican food!) and played games, until it was too late. We had an argument since some people wanted to sleep and some wanted to party, and we were crowded in a small space. It was difficult to fall asleep that night, because there was nowhere to go. I ended up cuddling with my gay best friend, breathing deep, finally able to fall asleep. The next morning, a couple left early, but not before we were able to call the trailer to tow the car. We were lucky that Jacques knew the guy working there, since otherwise they would not have done it. They left, and then we had breakfast as a group of 9. We then went outside to watch the river go by and talk, coffee in hand. Most people left, and then we were, the four girls once again. We were happy to be together, because it was exhausting to be as many for hours on end. It felt like coming home. It underlined the fact that we were an amazing team. We finished cleaning and packing up, and we had Jacques drive us to our car. He kindly kissed our cheeks and said goodbye. He said that he was lucky to have been around young and pretty girls all weekend, that his friends would be jealous. He got back to his dirty pick-up truck and went back to his normal retiree life. We left in the sunshine and stopped for gas and M&Ms on the way back. Two kinds, peanuts and pretzels. We were happy to be the four of us again, snacking away, and dreaming about an eventual road-trip. The conversations were flowing, and we were all on the same track. Whatever happens, nature catastrophes or arguments, we know that we always get each other. We went back to Montreal completely out of touch with reality, to the point where we were surprised to see a black man. I went back to my tiny apartment, crawled into bed and slept away, in my own little boat.